from glass slipper dreams, shattered: Like a stupid girl with glass slipper dreams, I did everything you wanted with the hopes that one day, you would love me back. 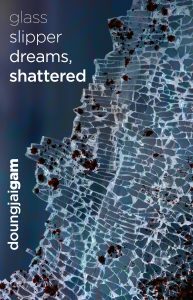 glass slipper dreams, shattered the debut collection from doungjai gam is out now! filled with loss, sorrow, revenge and remorse, it is not to be missed. gam delivers devastating punches in this collection of short-shorts, taking our breath away with a turn of a phrase, a dark play on words; every syllable paints unexpected shadows in our imagination. Reminiscent of Mercedes Yardley’s work, doungjai gam’s stories and prose poems are small gems filled with heartbreak, sorrow, and longing, but they also hold light in the darkness and hope in the despair. Lovely! doungjai gam writes powerful vignettes, songs of darkness and sorrow, anger and pain, with a beautiful prose style. Each tale, regardless of length, another examination of the human condition and the fragments left behind when a soul is shattered. Beautifully tragic. doungjai gam’s flash fiction exists in a liminal space between poetry and assassination. Every single word in Glass Slipper Dreams, Shattered was chosen for its greatest impact, and the stories are all breathtakingly precise and perfectly honed. Slow down and take your time with these stories. Gam’s beautiful writing is so sharp it could cut a shadow. Tales brimming with fear, dread and horror—a strong, unique new voice!